After weeks of uncertainty, Irish fans now know where to head for Mick McCarthy’s first game back in charge. 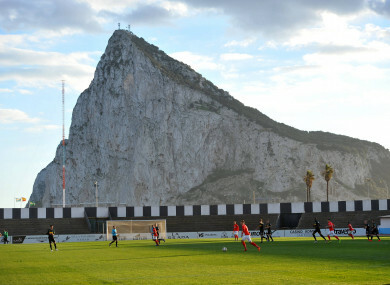 Borussia Moenchengladbach and Standard Liege play a friendly at the Gibraltar venue. FOLLOWING WEEKS OF uncertainty, the FAI today confirmed that Ireland’s opening Euro 2020 qualifier will take place at the Victoria Stadium in Gibraltar on Saturday, 23 March. The qualifier was initially slated for the tiny, 2,300-capacity ground, but confirmation of the venue was delayed owing to Uefa objections that the stadium was not up to standard. While Gibraltar were allowed stage their Nations League games on home soil last year, their previous qualifiers were staged at the 30,000-capacity Estadio Algarve in Faro, and belated Uefa concerns led to the possibility that Euro 2020 qualifiers would be moved. However, the Gibraltar FA have now made the necessary upgrades to the stadium and its operations and the game will go ahead as planned. The FAI also confirmed that they have secured 800 tickets for travelling fans – more than was initially expected. They will be allocated according to a new structure: 65% will be given to independent supporters who are members of Republic of Ireland Soccer Supporters Clubs and Fans’ Direct; 20% will be distributed to supporters from affiliated football leagues and 2,000 clubs; and the remaining 15% will be will be provided to supporters travelling with the FAI’s official travel partner, Abbey Travel. Email “FAI confirm opening Euros qualifier will take place in Gibraltar ”. Feedback on “FAI confirm opening Euros qualifier will take place in Gibraltar ”.